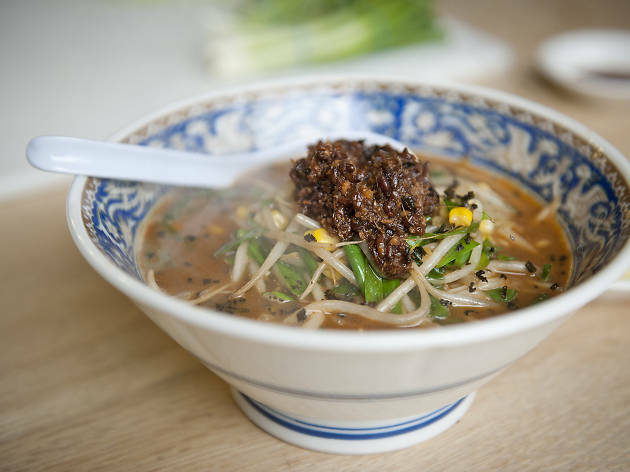 New York is mighty serious about its noodles, with ramen counters cropping up from the Lower East Side (Ivan Ramen) to Long Island City (Mu Ramen). The latest to join the ranks is this 10-seat educational slurp shop from the Sun Noodle team, whose superior strands have been a secret weapon in noodle houses on both East and West Coasts—including NYC’s Momofuku Noodle Bar, Totto Ramen and Hide-Chan, among countless others—for three decades. During the day, the restaurant runs as a testing facility, opening its kitchen—by appointment only—to chefs looking to tweak recipes and master the art of the noodle. At night, the “lab” portion is evident in scientific details: beaker water glasses, ergonomic chopsticks with tornado-shape ridges for noodle-gripping and even an aluminum-lined ceramic bowl—designed by chef Shigetoshi Nakamura himself—to keep the soup as hot as possible. Take a seat at the blond-wood bar, where Nakamura layers bowls of miso and shoyu ramen with full-bodied xo and torigara broths, marinated pork belly and fresh toppings (minced scallion, bean sprouts, cabbage), and slings small plates like ginger-pork dumplings and pickled eggs. Average ramen: $13. 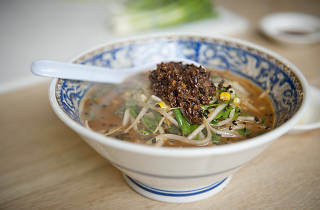 AmEx, MC, V.
As a ramen lover, you must visit Ramen Lab. While whatever they might be serving may not be up your alley, the fact that there is constant rotation of ramen chefs congregating at one spot really appeals to me. There have been chefs from all over the world from Japan where ramen orgiinates, France, and the US. I'm always intrigued at which chef is coming because the take on noodles, broth, base, and toppings vary from chef to chef but the essence of a bowl of ramen is always their. It's when creativity in food comes in that the ramen changes. I almost left when the waitress told me that there were no eggs in the ramen. I am a sucker for the egg yolk you find in most ramen dishes. However, I was tired of walking around and was hungry so my mom and I decided to wait. At the time, Yume Wo Katare was there from Boston. It was a dining experience like no other. The chef entertained the restaurant and inspired everyone by talking about his goals and asking people to share theirs as well. It was the best ramen dish I have ever had in my life. The noodles were al dente perfection. They were handmade and thick. The broth was rich and smooth. I am sad that Yume Wo Katare is no longer there but I look forward to trying the next chef's concoctions! A must visit for any ramen lovers in NYC, Ramen lab is an experimental restaurant that features new ramen chefs from around the world each week. The menu is limited - there were only three choices when I went - but honestly you don't need any more. When I visited, the chef who prepped delivered hands down some of the best ramen I've ever had. Will definitely be returning. The space is tight (standing room only) and you will definitely have to wait, but the host does a great job of keeping the flow moving, people go in, slurp their noodles, and their out. It's definitely less about the dining experience and more about the incredible food and diversity of kitchen talent. Hours are limited to dinner time. Ramen Lab is a courageous project that gives the spotlight to ramen joints around the world that want a shot at the NYC eating culture. And I got to say; its working, I've never been more in love with ramen. Make the effort to go to Ramen Lab every time they change chefs, its only way to taste the effort and pride that goes into the passion that is ramen making. I'm glad that it has became an ramen incubator for new and upcoming chefs and look forward to emptying my bank account and filling my stomach.